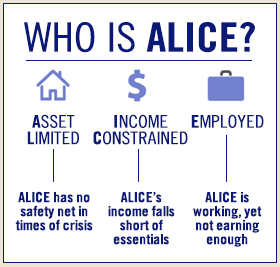 The United Way of Northern New Jersey conducted a third ALICE (Asset Limited Income Constrained Employed) study. ALICE is a local teacher, child care provider, mechanic, home health aide, an administrative staff person at a local company, and anyone else who is unable to pay for basic needs despite the fact that they are employed. The study provides county-by-county and town-level data; cost of living calculations for six family size variations; analysis of how many households are living paycheck to paycheck; and the implications for New Jersey’s future economic stability. More than half - 52 percent - of all jobs in New Jersey pay less than $20 an hour, with 72 percent of those paying less than $15 per hour. Black and Hispanic workers face higher rates of unemployment in New Jersey. Throughout the time period of 2007-2014, the unemployment rate for Black workers was more than double that of Asian and White workers. Nearly three-quarters of single female-headed families and more than half of single male-headed families in New Jersey lived below the ALICE Threshold, compared to 19 percent of married-couple families. Many hard-working people are unable to pay their bills in New Jersey. The high cost of living coupled with our challenging economy has not only made it difficult for people to save money but also forced many to borrow money to pay for basic needs. This survival pattern, while understandable, is precarious. A health emergency, an unexpected car repair or some similar unavoidable (and perfectly legitimate) need for cash can push a family into a financial crisis that makes it impossible to pay for basic needs such as housing, food or energy expenses, leaving everyone in the family and the community worse off. Read the full 2016 report to find out more. The need for financial assistance is always amongst the most frequently expressed needs of callers to our organization. Local United Ways throughout New Jersey and the rest of the country are focused on helping individuals and families achieve long-term financial stability by enlisting the help of partnering agencies and providing free services that educate and assist in reaching financial goals. Related pages in this section of our website offer money saving tips, introduce national and state organizations dedicated to helping people achieve financial literacy and stability, and acquaint you with local efforts underway to foster financial stability.